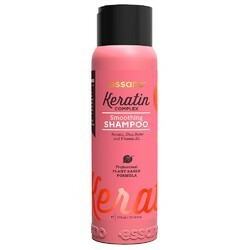 We are amongst the most reputed names in the industry, offering Keratin Shampoo. Usage/Application: Wash the hair with water and apply shampoo gently.Leave for 2-3 minutes and rinse thoroughly. We are offering Kehairtherapy Shampoo to our clients. Our firm is a renowned entity, engaged in offering a high quality range of OGX Anti-Breakage Keratin Oil Shampoo. Indulge in rich fortifying Keratin proteins that reinforce each strand, increasing elasticity to resist breakage caused by brushing and styling, with argon oil conditions and smoothes creating a luminescent shine. Usage/Application: Apply to wet hair,work up a rich lather,rinse thoroughly. Repeat if necessary. Infused with Keratin, the collection is specially formulated to leave hair sleek and shiny while eliminating frizz. Silky-smooth, gorgeous hair has never been easier to achieve! MURUMURU ANTI-FRIZZ KERATIN SHAMPOOThis MuruMuru Anti-Frizz Shampoo has combined pure keratin with MuruMuru Butter for an extremely rich and luxurious spa shampoo. Oleic and Linoleic Acids in the MuruMuru plant allow for a rich lather, while emollients deliver a natural vibrant glossiness that quickly eliminates frizz and repairs split ends with ease. Smooth hair, Dandruff free, Less hair fall.